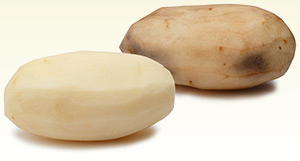 BOISE, Idaho -- The U.S. Department of Agriculture has approved Idaho-based J.R. Simplot Co.'s new genetically modified potato. But one of the company's oldest business partners -- McDonald's -- hasn't. The fast-food giant says it doesn't use genetically modified potatoes and has no plans to change that policy, the Idaho Statesman reported. "McDonald's USA does not source GMO potatoes, nor do we have current plans to change our sourcing practices," the company said in a statement. Earlier this month, the USDA gave Boise-based Simplot permission to begin commercial planting of its new spud, called the "Innate" potato. The company altered the potato's DNA so it produces less acrylamide, which is suspected to be a human carcinogen. Potatoes naturally produce the chemical when they're cooked at high temperatures. The GMO potato is also engineered to resist bruising. Simplot is a major supplier of french fries, hash browns and other potato products for restaurant chains like McDonald's. This isn't the first time the fast-food industry has resisted GMO potatoes. More than a decade ago, Monsanto brought its bug-resistant "New Leaf" line of genetically modified potato to market. Buyers, led by the fast-food industry, rejected the Monsanto spud, and it was pulled from production due to lack of business. Simplot spokesman Doug Cole didn't address the company's plans to sell to the fast-food industry or the dehydrated potato industry, which both have urged growers against planting GMO potatoes. But Cole said the fresh potato market would embrace Innate. Consumers will be receptive to the reduced sugars and potential carcinogens, Cole said. Because only 400 test acres of Innate varieties were planted and harvested this fall, production can't ramp up until after the 2015 harvest, he said. Rupert potato grower Duane Grant said he's been told by buyers in the dehydrated potato industry not to plant the GMO potatoes. But he hopes to line up willing buyers so that he can plant the biotech potatoes and reap the higher yields that come with their reduced bruising, he said. Consumers will be more receptive to Simplot's potato than Monsanto's because it benefits them, not just growers, he said. The key for Simplot and for growers, Grant said, will be convincing the food industry, which is worried about consumer backlash, to trust the product. "Brand equity is extremely important to quick-serve restaurants," Grant said. "They will avoid conflict whenever possible in order to protect equity of their brand name."